It says that sometimes the vibration of Lord Krishna’s flute is one of the impetus for the ecstatic love for Him. It seems that we are cut off from that – from hearing Krishna’s flute…at least it appears like that. But actually, those who have received second initiation are very fortunate because they have access to the vibration of Lord Krishna’s flute through the Gayatri mantra. The Gayatri mantra is the very vibration of Lord Krishna’s flute. When the sound of Lord Krishna’s flute entered through the ears of Lord Brahma then it came out of his mouth as Gayatri mantra. Therefore, anyone who doesn’t have second initiation, should endeavour to get it by preparing very nicely to get brahminical qualities so that one will be awarded this special initiation, so that they can also get access to the vibration of Krishna’s flute. In realising how amazing actually the Gayatri mantra is in considering this point. The brahmanas may chant with more attention. 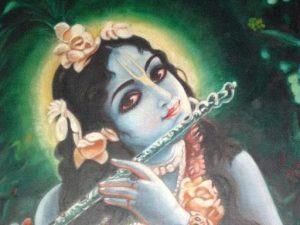 If we are inattentively chanting while Krishna’s playing his flute then we may not even hear it…and then the Gayatri mantra is finished and we haven’t really heard much of Krishna’s flute playing, then the ecstatic love may not come. His bugling is also described; His smiling; His footmarks on the ground; the transcendental fragrance of His body, and the appearance of the hue cloud in the sky can also become the impetus for the ecstatic love for Him. 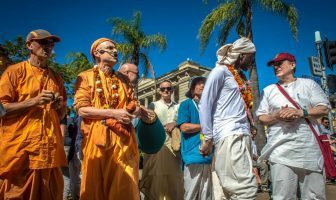 Now, here we are already describing quite an exalted state of Krishna Consciousness. We are now speaking about the uddīpana. The uddīpana are described in the Nectar of Devotion and in the Caitanya Caritamrta that Mukunda, who was a medical man, was engaged in the service of the Muslim king who was sitting on the throne and he was being fanned with peacock fans. He was sitting on a raised platform. So Mukunda was approaching on the raised platform, and when he saw against the light of the sun he saw the moving of that peacock fan, and suddenly he just remembered Krishna, and became overwhelmed and crashed to the ground! The emperor was very shocked to see that his doctor had crashed. What do you do if your doctor suddenly crashes? “Oh I am having some sort of a disease – an epileptic disease”. 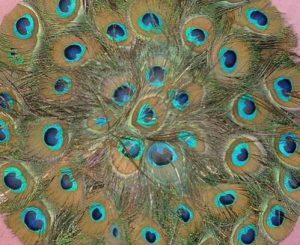 “No, it happened when you saw that peacock fan. What is this? I know it’s not a disease”.